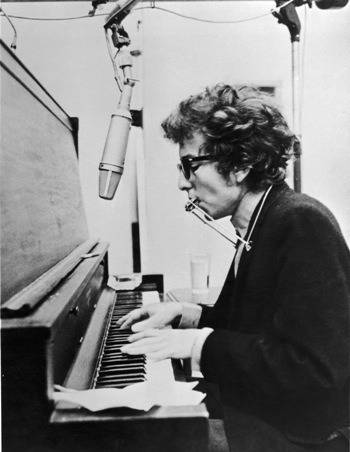 ¶ 4 Leave a comment on paragraph 4 0 Dylan is not a great piano player. His playing is sometimes as subtle as a police bullhorn. Yet, it exudes considerable charm. On Black Crow Dylan barrels along with a rollicking enthusiasm that pulls the listener in like a rude but charismatic friend. ¶ 5 Leave a comment on paragraph 5 0 The rollicking music is incongruous with the dark lyrics. The song, continuing in the vein of All I Really Want to Do, outlines a crumbling relationship. The narrator tells of the devastating affect his lovers absence has caused, and his willingness to do anything to mend fences. ¶ 6 Leave a comment on paragraph 6 0 Dylan commentator Paul William’s notes that Dylan used Robert Johnson’s Kind-Hearted Woman as a model for the lyrics. Author Matthew Zuckerman sees a relationship with Richard “Rabbit” Brown’s James Alley Blues. Dylan’s cover of James Alley Blues can be found on many bootlegs, including The Minnesota Tapes. ¶ 8 Leave a comment on paragraph 8 0 Dylan has never played this song live. Maybe he will reconsider now that he is playing keyboards at his shows on a regular basis. ¶ 9 Leave a comment on paragraph 9 0 Alternate take, Dylan on guitar. ¶ 11 Leave a comment on paragraph 11 0 The underrated Peter Case. Tell me what it’s all about. Listenin’ to the billboard knock. I’m too high to fall.